Many online poker fans appreciate the large traffic and excellent software at PokerStars, the worldwide market leader for internet card games. Americans are no exception – plenty of U.S.A. residents remember the experiences they had at PS before Black Friday in 2011 and are wondering how they can access bustling PokerStars USA lobbies again. 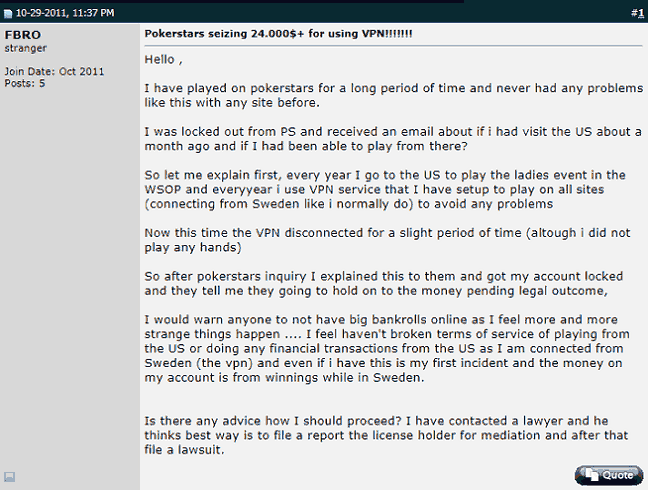 The short answer is that you cannot play on PokerStars from within the United States. There are very limited exceptions to this general rule, and we will go over every single one of them below. People in the Garden State are the only Americans who have the opportunity to log on to PokerStars and take a seat in the virtual games for real money. This includes both NJ's residents as well as those who are just passing through or visiting the state. You can open an account and perform cashier functions from anywhere, but you must be physically located within the State of New Jersey to engage in real money gaming. The company launched its NJ site in March 2016 to much fanfare in partnership with Resorts Casino Hotel, and it gained quite a few signups from people longing for a return to the good old days of USA online poker. Unfortunately, this enthusiasm was misplaced. Although the PokerStars NJ software platform is nearly identical to the much-lauded client in use throughout most of the rest of the world, player volume is lacking. You see, this poker solution doesn't interconnect with the worldwide PokerStars.com room. It instead limits people from New Jersey to playing only against others in the same state. Not only is this state-regulated site nowhere near its global counterpart in terms of customer liquidity, it's not even the largest online cardroom in NJ, instead having to settle for second place among licensed sites. The honor of biggest internet poker site for New Jersey goes to Sportsbetting.ag, an offshore operation. In New Jersey, there are only about 100 cash game players online at any given moment, on average, as compared to the 8,000 active at the PokerStars global site. PokerStars NJ is a division of The Stars Group (formerly Amaya Gaming), and it holds a valid internet gaming license from the Division of Gaming Enforcement. Of all the mainstream poker rooms in existence on the internet, PokerStars has perhaps the biggest selection of card game variants, and this transfers over to the organization's New Jersey site as well. 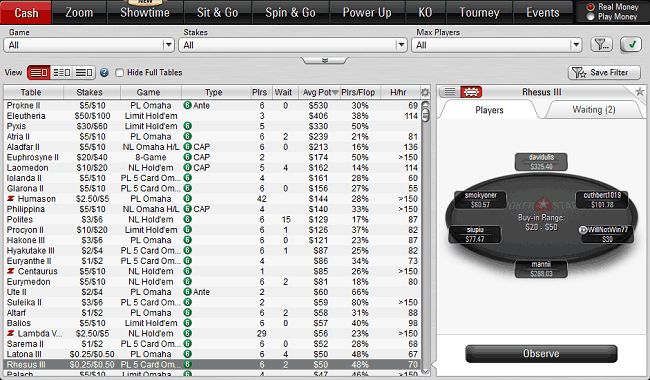 Not only are there No Limit Hold'em and Pot Limit Omaha tables denominated up to $25/$50, but there's also quite an extensive lineup of Limit Hold'em, LO8, 8-game, 5 Card Omaha, Razz, and more displayed in the PokerStars Lobby. It's important to be aware, though, that the games shown as available in the software and the games that people actually sit down for and play in are two distinct kettles of fish. According to our observations, the majority of these poker variants see zero action; the players all tend to be concentrated in just a few formats of the game. During peak hours, you'll encounter a total of a few dozen NL Texas Hold'em games going, from the lowest spread stakes of $0.01/$0.02 up to $2.50/$5.00 and sometimes $5/$10. In addition, there are usually a handful of PL Omaha tables active with $1/$2 or $0.50/$1.00 being the highest blind level to see regular four-card poker running. Beyond these two types of poker, you may sometimes find a couple of tables of “other” games actually being dealt out. PLO/8 seems to be the most popular of these. Notably absent from the PokerStars New Jersey cash game offerings is fast-fold Zone Poker. Management probably evaluated the number of customers playing at the site on average and determined that the player pools just weren't there to support Zone. However, NJ poker buffs who wish to try out Zone-type gaming can do so with Sportsbetting.ag's Boost Poker. After sampling the broad range of gameplay provided in PokerStars' ring game section, we were dismayed to discover that the SNG menu is much more restrictive. Indeed, there's only one single format to play here: heads-up hypers. It is a plus that Pot Limit Omaha is present in addition to NL Hold'em, and they both range from $1 games up through $500 buyins. Even during the busiest times of day for this internet poker venue, we seldom saw more than two sit-n-goes playing out simultaneously. The overall low traffic levels at PokerStars NJ probably combine with the Spartan nature of the sit & go lobby to cause this dearth of running games. Compensating somewhat for the lack of sit n' go action, the well-known PokerStars Spin & Go product is alive and well in New Jersey. This lottery-style poker tournament seats three and determines the prize pool by multiplying the buyin value by a random number from 2x to 1,200x. Spin & Go is a winner-takes all affair, except if one of the three highest multipliers (1,200x, 200x, or 100x) is hit, in which case second and third place each receive 1/12 of the prize pool. NLHE Spins are denominated at $1, $2, $5, $10, and $25. While the Spins section isn't busy enough to get into a game in seconds, it is possible to wait no more than a few minutes for two others to join at the lowest buyin levels. Higher-stakes action may involve longer waiting times. The PokerStars tournament schedule is pretty jam-packed and contains such delights as Progressive Knockouts, time-based tourneys, and deep-stack events. Unfortunately for fans of massive MTT paydays, the guarantees associated with these tournaments are generally pretty paltry. For instance, there's a Sunday Special here for a buyin of $186 + $14. Yet, U.S. residents who are reminiscing about the $1 million guaranteed Sunday Major at the main PokerStars .com worldwide site will undoubtedly be disappointed by the NJ Sunday Special's guarantee of just $30,000. 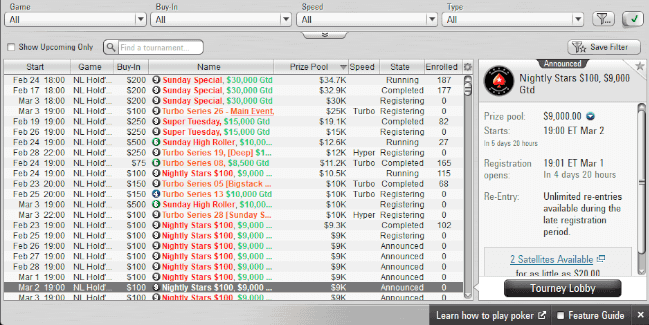 It's a similar case with the Sunday High Roller: a $470 + $30 competition that promises just $10,000 in guaranteed prizes. Things are a bit better when there's a premier PokerStars series taking place. The latest installments of the PokerStars New Jersey Spring Championship of Online Poker (NJSCOOP) and PokerStars New Jersey Championship of Online Poker (NJCOOP) each boasted more than $1 million guaranteed. Still, these seven-figure commitments merely place PokerStars in contention with offshore competitors. Honestly, there are many MTT series, hosted by USA-friendly international internet poker sites, that put 'Stars NJ to shame, including the Black Diamond Poker Open at Ignition and the OSS Cub3d at the Winning Poker Network. 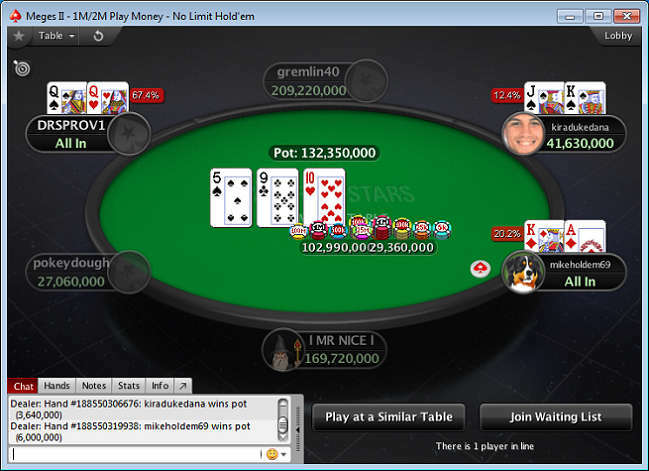 There are quite a few promotional deals granted by PokerStars to its user base. Some of them are intended solely for new customers, but others are ongoing promos that deliver regular value to people who continue to play at the site regularly. $30 Free Play: Upon making your deposit of $20 or more, you'll be able to claim $30 in free plays. This consists of 3x $1 Spin & Go tickets, 1x $2 Spin & Go ticket, 1x $5 Spin & Go ticket, and $20 in cash bonus. The various components of this package will be credited to you over the course of the seven days after you register for PokerStars. There are no playthrough requirements attached to any of these perks. 100% up to $600 Bonus: You can elect to instead snag a 100% matching bonus on your initial deposit up to a maximum of $600. As a matter of fact, you're allowed to make up to three separate deposits within 60 days, and all of them will add together to determine the size of your bonus as long as it doesn't exceed the $600 cap. The bonus releases $10 every time you rake $20, for a 50% PokerStars rakeback rate, and you have four months from the moment of each deposit to earn out the bonus associated with that deposit. As long as you opt into the Stars Rewards program, you'll earn reward points as you pay rake and contribute tournament fees. You'll see a progress bar near the top of the poker lobby, which will increase the more points you get. Complete the bar to receive a chest. When you open a chest, you'll receive goodies like freeplays and StarsCoin. Then the progress bar will reset, and you'll be given a new points target to achieve to obtain the next chest. 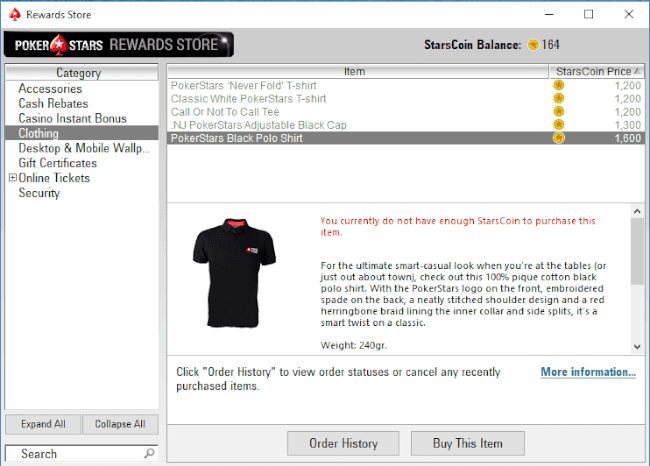 StarsCoin can be spent in the Rewards Store. This is a way for you to turn your StarsCoin into merchandise, tournament tickets, casino bonuses, and other valuable freebies. The number of points needed per chest varies based upon your playing history, and the combination of rewards contained within each chest is also personalized to some extent. This makes an evaluation of the worth of the whole system somewhat chancy, but according to most users, it's equivalent to no more than about 10% - 15% cashback. Every month, PokerStars NJ runs a leaderboard for which players get points whenever they finish in the top 15% of the field in a multi-table tournament. The number of points received depends on the finishing position, the size of the playing field, and the buyin. Each user's leaderboard position is determined by their 20 best tournament results for the month. At the end of the month, the top 60 individuals on the leaderboard will walk away with prizes ranging from $25 tournament dollars up to $1,500 tournament dollars. These tournament dollars (or T$) are valid for entry into any PokerStars NJ online tournament. Notably, the convenient PayPal e-wallet can be used to fund your 'Stars NJ account. It actually works as billed here as opposed to certain other sites that have loudly bragged about their PayPal compatibility (*cough* Global Poker *cough* 64spades), which ended up not working out as planned over the long term. Other interesting payment channels that you might not be familiar with are Resorts Cage, which refers to showing up at Resorts Casino with cash in hand; PokerStars Play+ Card, which is a type of prepaid card tied to your PokerStars account; Stars Transfer, a version of online banking bill pay; and PayNearMe, a system whereby you can made a deposit at 7-Eleven stores throughout New Jersey. Most of these deposit processors are also present in the withdrawal menu. 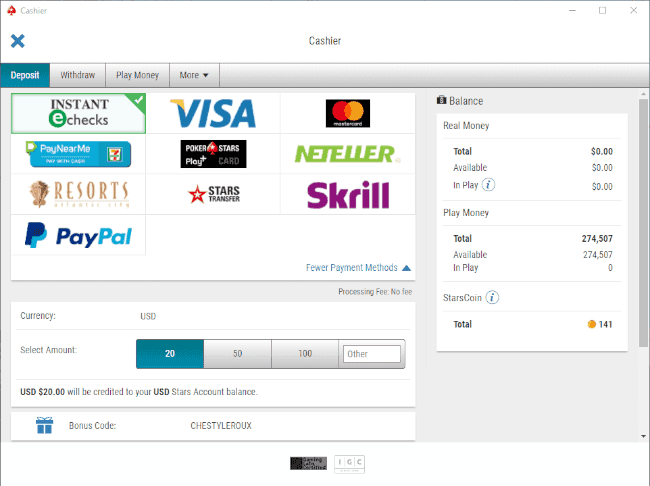 However, Visa, Mastercard, Stars Transfer, and PayNearMe are not available for cashouts. It's possible to play at NJ PokerStars from your mobile device. There are apps for both iOS and Android available for download. PokerStars has pivoted in recent years toward diversifying its revenue streams through the provision of other types of gambling besides poker. To this end, it has incorporated casino gaming within its product portfolio. 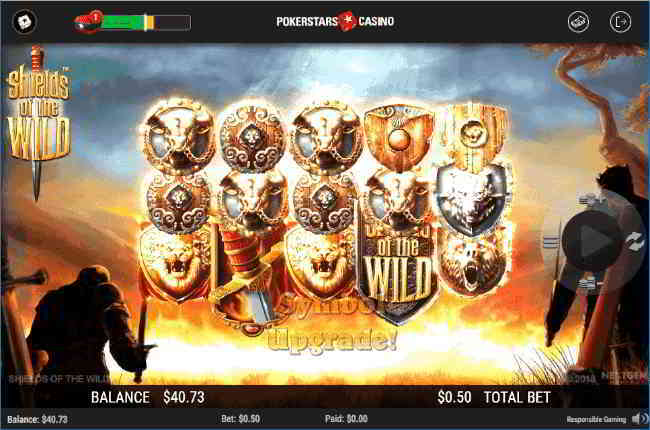 This casino is accessible both through the poker client and via the web. You can play the games through iOS and Android apps as well. The number of games present is well below what most other internet casinos have – even other casinos active in the small New Jersey market. There are fewer than 150 slots along with less than a dozen table games and a handful of video poker options. This restricted game library is even smaller for the mobile casino. There's no PokerStars NJ Live Dealer Casino, but this site does have multiplayer casino games with each participant occupying a designated position at the table and being able to type in the chatbox to communicate with others. This could become a rather unique aspect of PokerStars' casino gaming, but there are only a few games spread for multi-player at present. The sports betting division of PokerStars, known as BetStars, opened an online sportsbook in New Jersey following the May 2018 Supreme Court decision in Murphy v. NCAA, which ended the federal ban on this form of wagering. Therefore, you can risk your money on the outcomes of athletic contests using the same credentials and funds as your regular PokerStars NJ account. There's an In-Game betting section where the odds constantly shift as the play progresses, and you can place your wagers depending upon what's happening on-field. One issue with the BetStars sportsbook is that only 13 different sports are listed. All the major U.S. leagues, like MLB, NFL, and NCAA, are here, but some of the more niche forms of athletic competition are absent. For broader coverage, it may be best to join up at a full-featured USA-serving online bookmaker. While we would have liked to have seen a regional room with the same vibrancy and allure as the main PokerStars .com site, the NJ offering falls quite a bit short. This is only to be expected as the population of New Jersey is just over nine million while there are hundreds of millions of people in the worldwide areas that PokerStars serves. Those who are just visiting the state are also able to register and play, but even when we consider these transient players as part of the total, we can easily see that there's no chance of this single state hosting as many real money poker customers as the rest of the world combined. Anyone living in or planning to visit New Jersey will probably want to check this site out. For all its shortcomings, it does provide some excellent bonus value, and it is a reputable, fair place to play with great poker software. However, for your day-to-day grind, you might do better to find an offshore site, most of which have greater traffic levels and thus more games to take a seat in. Read more about your options as a New Jerseyite in our overview of the leading NJ offshore poker rooms. 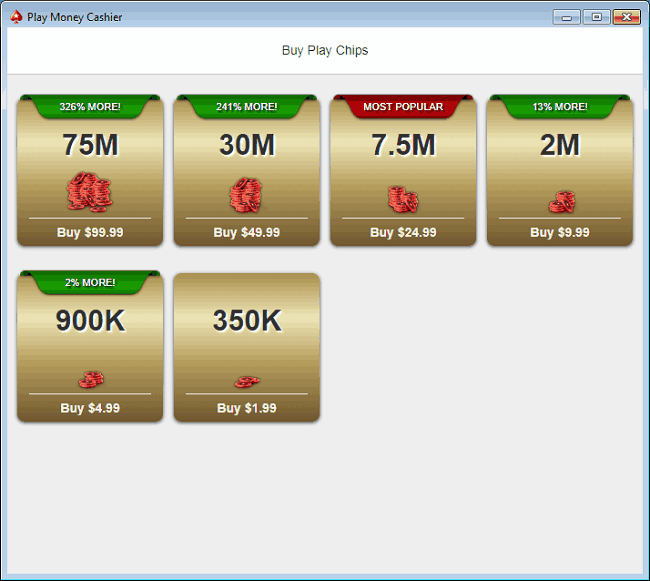 It is actually possible for American users to enjoy poker at PokerStars but only for practice chips. These play money games are offered to customers in 49 states (sorry Washington State). Apart from a certain amount of chips that you can get for free, you have to pay to purchase more of them. It's impossible to cash these chips out even if you should win a billion of them. There used to be online markets for PokerStars play chips, but the site has effectively prohibited this practice by disallowing play money person-to-person transfers. You might as well devote any money you intended to commit to purchasing practice chips to legitimate offshore poker rooms instead. At least this way, you'll be able to make a withdrawal if you grind up a bankroll. Minimum deposits at these poker rooms are pretty reasonable, $25 or less in most cases. PokerStars, in addition to its regular play money lobby in the download client, has also developed a mobile app called PokerStars Play for iOS and Android devices. This is a social casino/cardroom that's open to residents of the United States (except Washington State) and Australia. It's strictly for entertainment purposes, and the chips you win cannot ever be cashed out. In addition to poker, it has slot machines and Live Dealer casino titles. The PokerStars Home Games section lets people compete against their friends, work colleagues, online forum companions, and other individuals who are part of the same Poker Club. Nevertheless, U.S.A. players are only permitted to play with fake chips even within the strictly controlled membership model of PokerStars Home Games. Some enterprising souls have realized that they can set up play chip Home Games and use them to play for real money by assigning each chip a cash value and then making money transfers among themselves. This works in theory, but in order for everything to be aboveboard, you have to know and trust everyone else in your Poker Club. This is quite a different experience from signing on to the poker platform and sitting opposite all kinds of players from around the world. You'd also better hope that the site doesn't get wind of what you're doing, or else your club will be shut down. What About Nevada, Delaware, and Pennsylvania? Individuals living in one of the other three states for legal, regulated poker might assume that they can play on PokerStars, but this is incorrect. PokerStars only has a license to operate in New Jersey. Delaware's supervised internet poker market uses the software mandated by the state lottery, which reached an arrangement with 888, shutting PokerStars out of the market completely. Nevada has “bad actor” clauses in its enabling legislation for online poker, which has kept PS out of the market until 2018 when the company is expected to apply for a license. Meanwhile, Pennsylvania's online gaming market hasn't yet come to fruition because the bill that created it only passed into law in October 2017. New Jersey, Nevada, and Delaware now have a liquidity-sharing compact whereby sites are allowed to combine their player traffic across all three states. Only 888 (branded in some cases as WSOP) has really been the beneficiary of this arrangement because it's the only operator licensed to do business in more than one of these states. Suffice it to say that this multi-jurisdictional agreement doesn't have any impact on 'Stars, which runs stateside poker only in New Jersey. Some laud the advantages of deploying VPN (virtual private network) technology to circumvent the PokerStars ban on new account registrations from the United States. This refers to a system that disguises your computer's location and makes it appear to be in a region that PokerStars accepts customers from. Anyone who advocates this course of action is either woefully ignorant of how internet poker actually works or is attempting to give you bad advice. There are any number of reasons why running a VPN to surreptitiously log on to 'Stars is just asking for trouble. First of all, you'll encounter issues when attempting to request a payout because you will very likely be subject to account verification procedures. This means you would have to set up a fake address in another country, which might be more trouble than it's worth. Furthermore, PokerStars security has developed procedures to deal with anyone who might be playing from a prohibited jurisdiction. 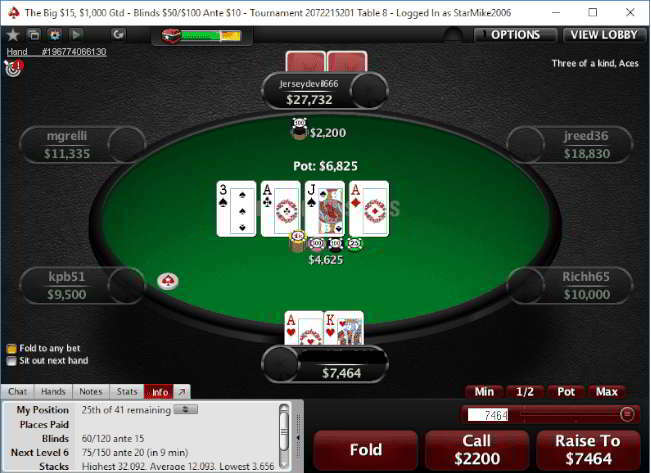 As part of the detection process, the poker client scans through the list of your running programs. You could get in trouble and have your account banned and balance seized if you're running VPN software. The same is true of other mechanisms for playing from a disallowed country, such as the use of Team Viewer or other remote desktop applications. Even big-name individuals aren't immune from the ever-vigilant personnel at the PokerStars security team. 2016 World Series of Poker Main Event runner-up Gordon Vayo ran afoul of the poker room after they contended that he was using a VPN from the United States when he scored $700K in a Spring Championship of Online Poker event. Gordon claims that he has submitted proof that he was in Canada at the time, and the dispute ended up in court. Lest you be hanging your head in dismay at the difficulty of joining PokerStars games as a U.S. player, let us assure you that you're not missing much — or least not as much as you would have a decade ago. Simply put, this virtual poker room has gone downhill in the intervening time. Much of this decline is a result of the acquisition of PokerStars by Amaya, Inc. (now called The Stars Group) in June 2014. This publicly traded organization has a different philosophy than the old owners of the company did. Amaya has put shareholders and short-term financial results at the forefront and relegated player concerns to the sidelines. The Chests program has cut rewards by more than half for dedicated grinders, and it's so confusing and variable that users don't really know what to expect in terms of freebies for a given number of hands played at particular stakes. Note: That isn't gold - it's rice cakes. Ignore the yellow color; they're good for you. We swear! Other unfavorable alterations to the way the firm does business include the addition of currency conversion fees, the retroactive restriction of affiliate commissions to the first two years of rake generated by a referred player, and a failure to adequately explain its corporate decisions to the player base. In conclusion, we must counsel you that it's impractical and too risky for you to try to play at PokerStars from the United States. Even those in New Jersey who can enjoy the 'Stars real money games are ring-fenced to a small pool of games that will likely leave them disappointed. This doesn't mean that you can't play internet poker though. There are a number of trustworthy offshore online poker sites that cater to the American market. They have profitable welcome bonuses, robust traffic levels, and speedy payouts. You can learn more about these solid operators by reading our U.S.A. online poker guide. If you still have questions about PokerStars USA legalities and information, then look below for possible answers. There are no federal laws prohibiting internet poker in the U.S.A. The Wire Act has been ruled to relate only to sports betting, not to lotteries or online poker. The UIGEA, therefore, doesn't come into play either as it's only triggered when another federal or state anti-gambling law applies. In any case, these pieces of legislation target the owners and managers of the gaming sites, not individual players. So there's nothing preventing you from opening up a few tables of online cards and playing as much as you want. Is PokerStars legal in the United States? There's nothing preventing PokerStars from legally serving the United States. Nor is there anything making it a crime for individuals to open up accounts and play for real money. Nevertheless, it's impossible to partake in these services as an American (in most states) for reasons we go into below. Why did PokerStars leave the U.S. market? PokerStars abandoned the U.S.A. real money poker market as a consequence of a settlement it reached with the Department of Justice in 2011. This agreement followed the Black Friday crackdown on internet poker by U.S. government authorities. The basis for these law enforcement actions was the Wire Act even though the DoJ opined soon thereafter that this Act didn't concern online poker at all. Be that as it may, as part of the resolution of the case against it, PokerStars pledged to remove itself from the American internet gaming market except in those jurisdictions where it's specifically licensed to operate. What states are able to play at PokerStars? Currently, PokerStars holds a license to offer its real money games only in the State of New Jersey. Play chip tables are available in every state apart from Washington. Why doesn't PokerStars operate in any states besides New Jersey? PokerStars has pledged to avoid dealing out internet poker hands for real cash in any state except those that it holds a gaming license for. As of July 2018, this list consists solely of New Jersey. Delaware and Nevada have regulated internet poker ecosystems too, but PokerStars is not licensed to transact in either of these jurisdictions. Pennsylvania is the newest entrant to the legalized, state-regulated online poker scene, but no entities have yet successfully gone through the license application process, and this includes PokerStars. Do I have to be in New Jersey to open an account at PokerStars NJ? No, PokerStars NJ lets you register your new account from anywhere in the world. You can also make deposits and withdrawals without being present in New Jersey. However, gameplay is only available if you're located inside state borders, and the site uses sophisticated geo-location tech to confirm your location at all times. How does traffic at poker sites available in the USA compare to PokerStars? None of the rooms for American poker have traffic levels that reach the mark set by the global PokerStars brand. 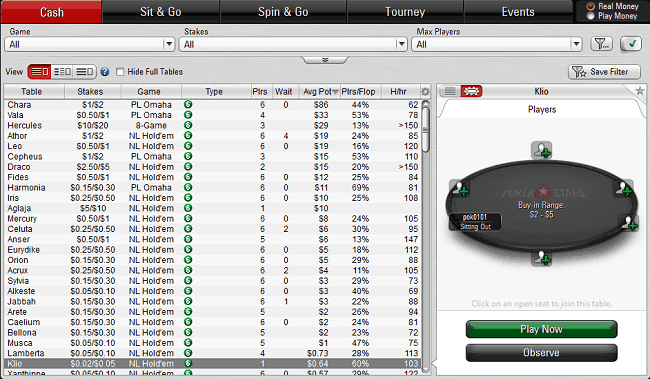 However, many of them are a fair bit larger than the segregated NJ PokerStars site. In most cases, you'll have no trouble finding a game if you're interested in micro- or small-stakes tournaments and cash games. Only if you play for high stakes or are a serious multi-tabler might you have issues finding enough action to keep you happy. Even in this case, you'll probably do all right if you're willing to mix stakes and table sizes. What types of games do sites other than PokerStars have? All of the destinations for online poker in the United States have ring games, sit n' gos, and multi-table tournaments although certain formats are more popular at different sites than at others. There are several places in the U.S. market that spread lottery SNGs, reminiscent of PokerStars Spin & Gos, too. Fast-fold Zoom/RUSH clones are a bit less prevalent, but there are a couple of choices if this is your game type of choice. How can I made a deposit or withdrawal for real money online poker in the United States? This is one of the trickier aspects of playing online poker in the United States. Credit cards will work for deposit depending on how strict your card issuer is in blocking gambling-related transactions. When it's time for a cashout, you can usually retrieve your funds via check. However, crypto-currencies like Bitcoin tend to be superior for both deposit and withdrawals because they're almost never declined and the fees associated with their use are miniscule. To find out more about the most commonly supported digital coin, head over to our Bitcoin gambling guide. There are other options available at some sites, like Ethereum and Bitcoin Cash.